The end of September means it’s time to start focusing on the next big holiday. No, I do not mean Christmas even though the decorations have already started sneaking into stores. I am referring to Halloween, one of my favorite days. Then again, it is filled with lots of sweet treats. 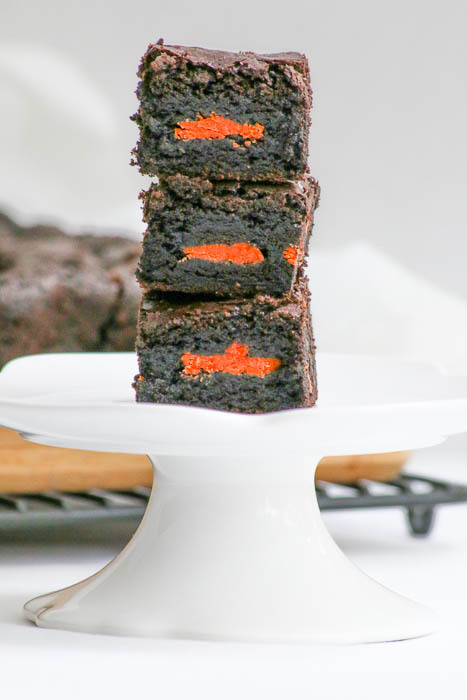 The idea for Halloween Oreo Brownies came to me when saw a bag of orange filled Oreo cookies with Halloween symbols on the cookie part. I bought a package and then got busy in the kitchen. During round one of the brownies, I placed whole cookies between the layers of chocolate batter. I did not care for the ratio of brownie to cookies, as there were too many bites that did not include the sandwich cookie. The next time around I broke the cookies into quarters, well, most of them. 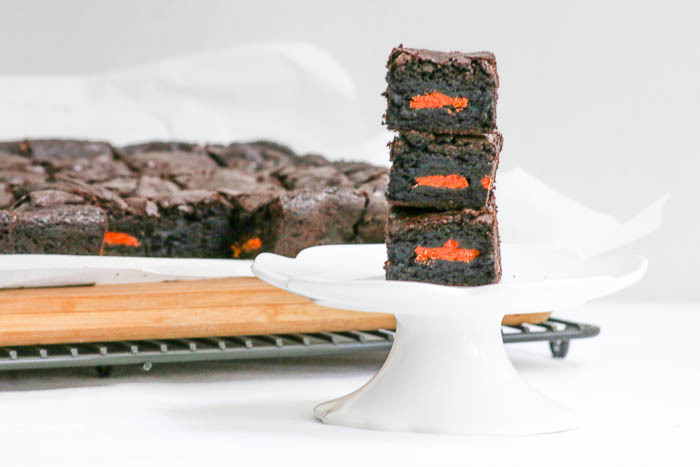 This method worked so much better because every bite was filled with a combination of brownie and cookie. I, also, loved the orange and black color contrast. 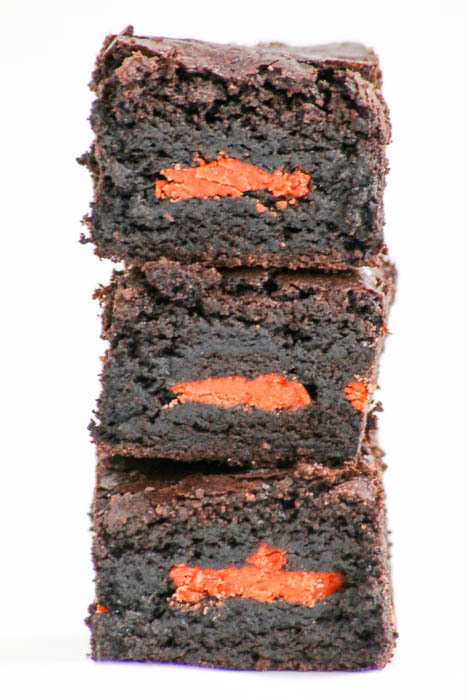 One note about the deep dark color of my Halloween Oreo Brownies, I used a very deep cocoa powder that is almost black in color. If yours is a lighter cocoa powder, the taste will still be fantastic but the color will be a bit lighter. Line a 9" x 13" baking pan with parchment paper and set aside. Melt the semisweet chocolate, unsweetened chocolate and butter together. Stir until smooth. Place the eggs and sugar into a large mixing bowl. Mix until blended. Add half of the dry ingredients followed by the melted chocolate/butter and vanilla. Blend in the remaining dry ingredients. Transfer half of the batter to the parchment lined baking pan and use an offset metal spatula to spread it in the pan. Evenly place the Oreo cookies on the batter. Spoon the remaining batter over the cookies and use the spatula to gently spread the batter over the them. Bake at 350° for 35 minutes. Remove from the oven and cool before cutting into bars. Your method turned out beautifully! I love the idea of getting a bite of cookie in each bite. So festive! These look delicious. I’m going to gain 10 pounds eating them. Well, maybe just 1 or 2….depending on how many you share!